Continuing from Vagaries' weather narration, F4 has moved eastwards beyond Utteranchal and is weakening into Nepal on Saturday. Saturday saw Dehra Dun (Utteranchal) having a cold day with the high at 18c, 6c below normal, with 1 mm of rain. In the state's hills, Mussoorie (AWS) had a high of 5.5c, with light rains in the daytime, while Champawat AWS could manage 9c as its day temperature. Peaks of Garhwal, Badrinath, Kedarnath, Gangotri, Yamunotri, Auli, Nanda Devi and some areas of Munsiyari were covered with fresh snow. 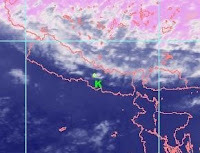 ed some light traces of rain on Saturday, and was just about in the vicinity, as the sat.image (courtesy Nepal Met) shows. Onwards to F5 now. This sytem can be seen today, near Dubai and west of Pakistan. It is possible that this system will gain more moisture from the Arabian Sea en-route to the Sub-Continent, as upper air pressure conditions are favourably placed for such an eventuality. On Pakistan by Sunday night, and good precipitation commencing from Balochistan thru Upper Sindh regions and NWFP into Punjab (Pakistan) on Sunday evening into Monday. As it moves into India on Monday/Tuesday, flow of SW moisture from the Arabian Sea continues, and will result in rains along the Sindh coast, including Karachi on Tuesday. Pockets of heavy thundershowers could be expected along the coast and in the sindh interiors due to vertical depth of the system. Tuesday, and F5 is on India. Affecting the states of Kashmir and H.P. with snowfall again and Punjab, N.Rajasthan, Haryana and west U.P. with rains. More on F5 monitoring as the system moves into India on Monday. Meanwhile, NW winds will sweep the plains of India from Tuesday, and 'dry out" the feeble UAC (mentioned below) forming over western Maharashtra. The day in Kathmandu yesterday (Saturday) was cloudy. I was in the south eastern outskirt of the city, and there was some persistent rain there but as i drove to the city center the rain was less persistent and very light.Today its a little cooler but we have a sunny day.